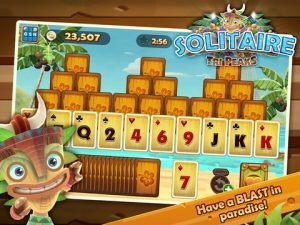 Of all the solitaire variants available, Tri Peaks is perhaps the most intriguing and highly engaging type I have played, it is a very popular solitaire game because its combination of two types of Solitaire which are Pyramid Solitaire and Golf Solitaire has over the years endeared this game to many online casino card games around. 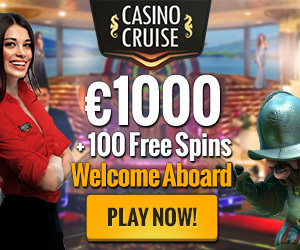 Apart from its very robust gaming idea, its system of scoring is very appealing because even if you don’t play all the moves available to you, you can still get very high scores. You may also be interested to know that there are 2 ways to maximizing your scores in the Tri Peaks Solitaire and they are by either forming long sequences or clearing each peak. 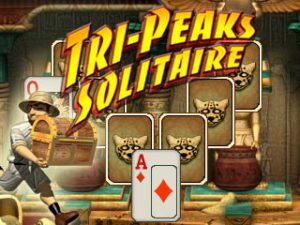 The first strategy to getting the best out of the Tri Peaks Solitaire is to ensure that in the course of the game, you form very long sequences especially where you don’t have to deal new cards from the rack. For this, the game’s scoring system will award you an additional point for each card you move within a sequence. For instance when you move the initial card, you get a point and the next card gets you two points and the sequence continues. However, this largesse is voided once you deal cards from the rack and then another scoring begins. Another very effective strategy is the idea of clearing each peak. Players usually get several points just for clearing a pack so if you are looking at getting plenty points from Tri Peaks, then you can’t afford to disregard this strategy. For clearing the initial peak, you will be awarded 15 points, another 15 points for clearing yet another peak and if you are able to clear the third and final peak, a whopping 30 points is added to your total score. What do you think the difference in scoring would be between one 12-long sequences versus two 6-long sequences? Most people know the long sequence will outscore the shorter sequences, but not many people realize by how much! Have you ever wondered how significant the difference will be in the scoring system of two 6-long sequences and a one 12-long sequence? Well, in my own experience, many people are aware that the longer sequence will accrue more points than the shorter ones but the extent of disparity of the score is what many can’t fathom. Here goes; in the two 6-long sequences, we will have 1+2+3+4+5+6 in two places which totals 42 points. Surely, the difference between this score and the other one can’t be alarming right? Think again! The 12-long sequences will give 1+2+3+4+5+6+7+8+9+10+11+12 totaling a shocking 78 points even though the same numbers of cards were selected in the two strategies. Another way to explain this is to study the implications of extending out a long sequence. What if instead of 12 cards in the sequence, we could somehow remove 14 cards in sequence instead? Well, that would give us an extra 13+14 points, which is 27 extra points. Adding two cards extra on the 12 card sequence almost resulted in as many points as two 6-card sequences! If the total score for a 12-long sequence is 78, what might then happen if by some chance we are able to move 14 cards into a sequence? Mathematically, that will mean 13 + 14 points for the extra 2 cards totaling an additional 27 points. Interestingly, having a 14-long sequence is just like having a 3 6-long sequence in place. So, technically, it makes more sense to form a very long sequence for not less than 10 cards for a chance to score great points. Usually, at the early stages of the game, it is normal to have quite a long number of cards but even at this easy level, most players are not able to have more than 10 cards. We advise that you familiarize yourself with the strategy below before you use that sequence. Firstly, Study the cards above the bottom layer and ensure that you find plenty of cards which are about the same rank. If there are any long sequences, you should then study the cards covering that sequence and then ensure that those cards are removed. Be sure not to remove cards that can make the sequence much longer even if you are tempted to play them in a shorter hand before they are ripe for the longer hand. However, this method has to be balanced in comparison to the second strategy which is to clear the peaks. You mustn’t keep your cards for longer than necessary waiting for the perfect sequence because it may hamper your chance of uncovering the peaks. You should understand that if you really wish to aim for one very long sequence, then you must channel all your strategy into getting it right. That is how to earn great points in Tri Peaks Solitaire.